Flexible car door magnets of magnetic sheets 0.85 mm thickness specially developed for cars, caravans, containers etc. Extra high quality ensures safe fastening even at high velocity. Professional product with excellent flexible abilities and high magnetic strength. If magnetic sheets are to be used on cars and other vehicles it is important that the sheets comply with special requirements regarding flexibility and strength. Several years of developing flexible car magnets has placed the Auto Superior magnetic sheet in the top of the market. They have to be used and applied correctly to achieve optimum performance of the product. Therefore, it is always possible to contact the sales department for advice and guidance if needed. The Auto Superior magnetic sheets are primarily designed for vehicles and other movable subjects. However, it is also possible to use the magnetic sheets for other applications thanks to the unique magnetic qualities of the product. The magnetic sheets are produced with white matt surface on which any type of graphic is easily applied via direct printing or adhesive foil. Watch the product video for the Auto Superior magnetic sheets here. Apply the Auto Superior magnetic sheets on almost every type of metal surfaces. The product can be cut with a utility knife to achieve the desired dimension. Please note, that this specific magnetic sheet for cars must have a certain dimension to attract the metal surface properly (not suitable for very small dimensions). This is due to the thickness of the magnetic sheet (0.85 mm) and the flexible abilities. Remember to read the instructions manual before application. Magnetic sheets for cars are recommended to be removed once a day to avoid damaging the paint of the car. The magnetic strength for these products reaches 42 g. per cm2. This ensures safe fastening of the magnet sheet even at high velocities. The latest development of the product has provided the magnetic sheet with additional flexibility compared to other types on the market. See the ”Sizes and variants” for price comparisons. The Auto Superior magnetic sheets are produced with white matt surface. It is also possible to make special production of glossy if larger quantities. Please contact the sales department for further information. The whole range of flexible magnetic sheets can be seen here. 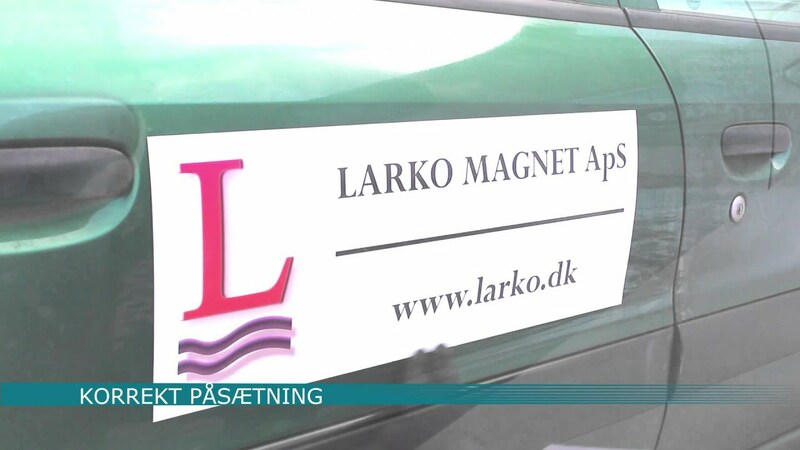 Please also see our range of Larko Flex magnetic sheets which are excellent alternatives. The instructions manual for use and print of magnetic sheet must be read before application. Application is not recommended at temperatures above 40 °C. Do not use magnetic sheets for newly painted vehicles. See instructions under “downloads”. Magnetic sheets are not suitable for chatboards.